This is the first OHSHC fic I've ever read, and I enjoyed it very much! A good intro to Kyouya/Haruhi. I haven't seen enough eps of the series to see how they work, but I love the aesthetic. That, and I can't seem to wrap my brain around Haruhi with anyone else. 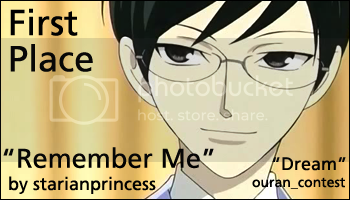 Except Tamaki, but I find him annoying at times, lol.